Prague is a breathtakingly beautiful city, and is the capital of the Czech Republic. Its mild, warm summers draw in travelers by the masses; that’s not to imply that visitors aren’t constantly swarming in to enjoy the city’s elegance. The cultural influences of Prague stem from the Renaissance and Gothic era, and its wonderful architecture and art reflect that. Prague is rich with history and cultural attractions, making it a popular destination for travelers who appreciate a city saturated with heritage. Although the city is known for its aged facet, it also has a wide variety of modern restaurants, museums, theaters, and galleries. Enjoy your stay in Prague in one of many of its high class hotels for the best traveling experience. The Mandarin Oriental on Mala Strana is luxurious hotel built on the site of what was formerly a 14th century monastery. You will be taken off guard by its authenticity. Its spacious rooms overlooks the artsy, cobbled stone streets, and are suited for an enjoyable stay. Another hotel in Prague is the Radisson Blu Alcron Hotel. Its central location in the heart of Prague keeps you close to the best attractions. You’ll be steps away from Old Town Square and Charles Bridge. Boscolo Prague offers 42 deluxe rooms that match the elegance of the city. The hotel’s dedication to maintaining a stunning appearance leaves travelers wanting to come back. The culinary scene in Prague is sure to enthrall any food enthusiast. Le Terroir serves only the most appealing wines, and a fine variety of European meals. Alcron provides an intimate atmosphere for occupants: it seats only seven tables. The seafood it serves is known across the globe. For a romantic evening, Bellevue offers an unbeatable view of Charles Bridge. For a more modern dining experience, Dancing House is one of Prague’s most successful restaurants, with an eccentric twist. Prague is full of historic wonders. Charles Bridge is considered its most romantic sight. 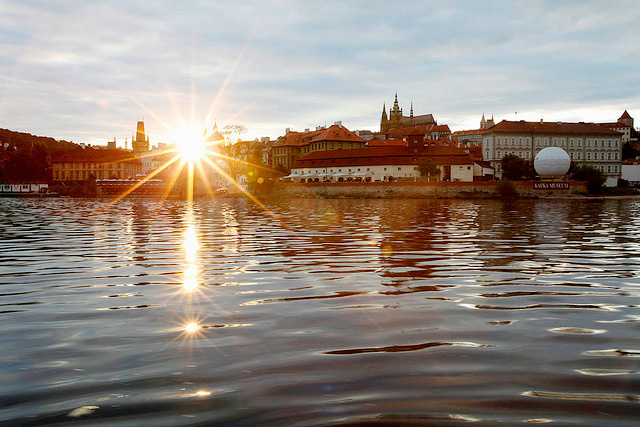 Take a casual stroll over the Vltava River for a wonderful evening. The Estates Theater is a must-see for music lovers. Mozart spent quality time constructing his masterpieces there. Jewish heritage is well represented in Prague, with attractions like the Jewish Museum and Jewish Quarter, which dates back to the 13th century. The Baroque Lesser Town Square is such a beautiful site, that it is often used for movie locations and commercials. The town has retained a majority of its original architecture, which dates back to the 8th century. Taking a bike ride or walk down the streets is sure to send shivers as you are sent back to olden days of Prague. Prague has been on my bucket list for years. I’ve been meaning to travel to this beautiful city, but other obligations come first. I know what you mean… those ‘other obligations’ tend to get in the way – But should you ever want to treat yourself to weekend away, Prague is perfect!